Mouth pain is one of the most common symptoms in children. It can be caused by a number of problems ranging from a mild injury to a serious infection. If your child complains of mouth pain, examine her mouth and ask her about the specific location of the pain. Contact your child's pediatrician and be prepared to explain all symptoms your child is experiencing to obtain a proper diagnosis. Simple injuries to the mouth are common causes of mouth pain. A child may bite her gums or lips, cut herself chewing on hard candy or injure her gums with a toothbrush. Inspect the inside of your child's mouth for any sign of abrasions or trauma. If you see open sores, pus, or bleeding wounds, contact your pediatrician. If you only see redness, your child may have irritated her mouth with salty or sweet foods. Wait a few days to see if the symptoms go away. In babies and toddlers, the most common cause of mouth pain is teething. Gums may swell or even bleed as baby teeth cut through. 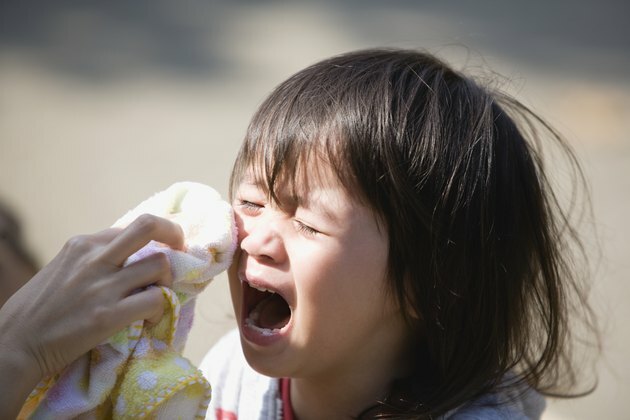 In some cases, babies develop fevers. If your child is having a particularly difficult time with teething, visit your pediatrician to ensure there's not a problem. Home treatment for teething includes teething rings, hard cookies and gum numbing gel. Cavities and dental abscesses frequently cause mouth pain in older children. Schedule an appointment with your dentist if your child complains of periodic pain in a particular location. If your child is in extreme pain or you notice swelling and your child has a fever, the cause may be an abscess. This requires prompt dental treatment, so be sure to tell your dentist or pediatrician about all symptoms your child is experiencing. Orthodontic problems such as crowded teeth may also cause mouth pain, particularly in the jaws. Infections such as strep throat and tonsillitis cause pain in the throat that may radiate to the ears, cheeks and gums. If your child complains of throat pain and has a fever, she may require antibiotics to treat the infection. Contact your pediatrician.